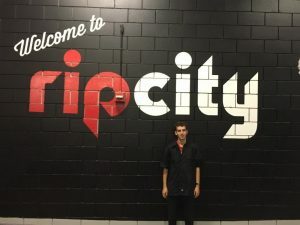 As an avid sports fan, 21 year old Josh Maclay’s goal was working around one of his favorite local teams, The Portland Trailblazers. Josh did not let his intellectual disability deter him from pursuing his dream job. After graduating from Westview High School with a modified diploma in 2014, he entered and graduated from the Beaverton Community Transition Program (BCTP) in 2016. BCTP helps young adults with disabilities increase their ability to live independently and gain valuable work experience. BCTP, The State of Oregon, Vocational Rehabilitation and Dirkse Counseling and Consulting, Inc. all played a part in Josh obtaining his dream job with Levy Restaurants in January 2016. Levy Restaurants provide quality food and beverages to patrons of events at The Moda Center and other similar venues worldwide. They promote an atmosphere of inclusion and diversity and are dedicated to assisting team members in reaching their potential. Josh began his career at Levy by washing dishes, collecting garbage, and stocking condiments. Because of his hard work and motivation he requested and was recently promoted to work this season as a Warehouse Runner, doing inventory and food delivery to stands during Blazer games. It is a fast-paced position that Josh welcomes since he is a very hard worker who likes to stay active and busy at all times. One of his Supervisors, Matt Hendryx shared “The experience working with Josh has been exceptional. He shows up on time, communicates well, does an incredible job and is so reliable.” Matt also shared that the experience working with Dirkse CC has been a good one with great communication from the team. “Josh is the priority with the focus on keeping him developing and growing. “ This is the goal of Dirkse CC; to match the client’s skills, abilities, goals and dreams to the employer’s needs, creating a “win-win” scenario for everyone. To learn more about employment opportunities, contact Cindy Bahl at 503-258-7715 (cindy@dirksecc.com).